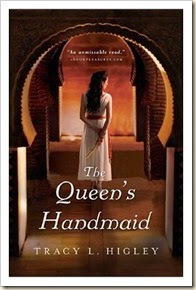 Tracy L. Higley has written a wonderful novel titled The Queen’s Handmaid. I loved reading this book for many reasons, one of which is that we are studying Cleopatra and Antony in our homeschool right now! I was drawn into this novel from the very beginning!! I loved the characters, as I immediately connected with the main character Lydia. I loved her heart and her struggle to figure out just who God is and what she believes. The historical connects in this novel are great too, I loved seeing it line up with the Bible, but also with our history studies in our home. I plan to let my son read this book, as it is a very clean, well told story! The romantic story that takes place is innocent, sweet and inspiring. I loved seeing Lydia grow closer to Simon as they both were drawn to each other over and over. Simon had honorable character, and respect for Lydia also. There is a bit of suspense in this story as well, as we wonder just what the mystery of the scrolls is. We also watch and hope that Lydia will be able to what she promised her friend as he dies, but will she be able to fulfill the prophesy? I highly recommend this book, and hope to read other books by her soon!! Orphaned at birth, Lydia was raised as a servant in Cleopatra’s palace, working hard to please while keeping everyone at arm’s length. She’s been rejected and left with a broken heart too many times in her short life. NOTE : I was offered a copy of the Queen’s Handmaid in exchange for an honest review, by LitFuse.